Capital of the canton of Basel-Stadt, Switzerland, bordering on the grand duchy of Baden and on Alsace. Owing to its flourishing trade, it was inhabited by Jews as early as the middle of the thirteenth century, or perhaps even earlier. In 1223 Bishop Henry of Basel borrowed large sums from Jews living there. They were not confined to a ghetto, as was the case in German and in Spanish cities; most of them lived near the cattle-market. Many of them dwelt in houses of their own, built on plots of ground belonging to the monastery of St. Leonard, to which they had to pay 30 solidi every Christmas. Besides this they were compelled to loan on demand 5 pounds to the council of the city for half a year on security, but without interest. In proportion to the number of houses they acquired and inhabited, their taxes were increased. They had their synagogue and their slaughter-house in the cattle-market, near the furriers' stalls. If cattle killed in the "schale" (butchers' stalls) were not fit to be eaten according to their dietary laws (see Ṭerefah), the meat was to be sold outside of the schale, in order that it might not come in contact with other meat. The Basel Jews had to pay tribute not only to the city, but also to the emperor, under whose protection they stood, and whose "Kammerknechte" they were. In 1279 Rudolph I. pledged to the bishop of Basel, "for his faithful services," the protection money paid by all the Jews in the diocese of Basel and Strasburg, in consideration of 3,000 marks (Lichnowsky, "Regesten," i., No. 90; Wiener, "Regesten," p. 11). 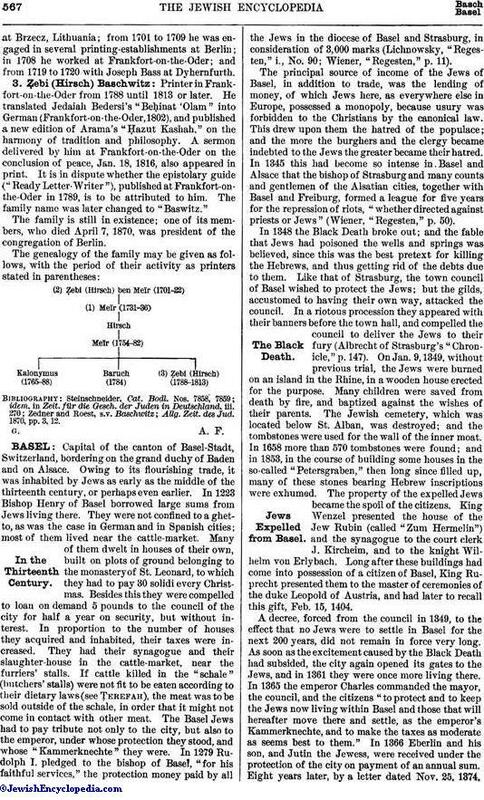 The principal source of income of the Jews of Basel, in addition to trade, was the lending of money, of which Jews here, as everywhere else in Europe, possessed a monopoly, because usury was forbidden to the Christians by the canonical law. This drew upon them the hatred of the populace; and the more the burghers and the clergy became indebted to the Jews the greater became their hatred. In 1345 this had become so intense in Basel and Alsace that the bishop of Strasburg and many counts and gentlemen of the Alsatian cities, together with Basel and Freiburg, formed a league for five years for the repression of riots, "whether directed against priests or Jews" (Wiener, "Regesten," p. 50). In 1348 the Black Death broke out; and the fable that Jews had poisoned the wells and springs was believed, since this was the best pretext for killing the Hebrews, and thus getting rid of the debts due to them. Like that of Strasburg, the town council of Basel wished to protect the Jews; but the gilds, accustomed to having their own way, attacked the council. In a riotous procession they appeared with their banners before the town hall, and compelled the council to deliver the Jews to their fury (Albrecht of Strasburg's "Chronicle," p. 147). On Jan. 9, 1349, without previous trial, the Jews were burned on an island in the Rhine, in a wooden house erected for the purpose. Many children were saved from death by fire, and baptized against the wishes of their parents. The Jewish cemetery, which was located below St. Alban, was destroyed; and the tombstones were used for the wall of the inner moat. In 1658 more than 570 tombstones were found; and in 1853, in the course of building some houses in the so-called "Petersgraben," then long since filled up, many of these stones bearing Hebrew inscriptions were exhumed. The property of the expelled Jews became the spoil of the citizens. King Wenzel presented the house of the Jew Rubin (called "Zum Hermelin") and the synagogue to the court clerk J. Kircheim, and to the knight Wilhelm von Erlybach. Long after these buildings had come into possession of a citizen of Basel, King Ruprecht presented them to the master of ceremonies of the duke Leopold of Austria, and had later to recall this gift, Feb. 15, 1404. A decree, forced from the council in 1349, to the effect that no Jews were to settle in Basel for the next 200 years, did not remain in force very long. As soon as the excitement caused by the Black Death had subsided, the city again opened its gates to the Jews, and in 1361 they were once more living there. In 1365 the emperor Charles commanded the mayor, the council, and the citizens "to protect and to keep the Jews now living within Basel and those that will hereafter move there and settle, as the emperor's Kammerknechte, and to make the taxes as moderate as seems best to them." In 1366 Eberlin and his son, and Jutin the Jewess, were received under the protection of the city on payment of an annual sum. Eight years later, by a letter dated Nov. 25, 1374,Emperor Charles presented to Duke Leopold of Austria the taxes of the Jews at Basel. Most of the Jews who settled in Basel had come from Colmar and other Alsatian cities, and were wealthy. In 1367 they presented to the council 200 gulden "for the journey of the emperor." The expenses for the fortification of the city were defrayed by voluntary—probably also by involuntary—contributions and loans from the Jews. In 1374 the Jews of Basel loaned to the council 5,000 gulden, one Jew advancing 4,000. In 1375 the Jews Menlin and Helya gave 20 pounds; others, as much as 50 and 100. In 1385 the Jew Moses donated "for the wall" 50 gulden, and a year later another Moses gave 70 gulden. In general, the Jews were merely protected; but some were received as citizens, though only for a limited number of years. On being accepted as citizens, they received a so-called letter of protection (Schirmbrief), enumerating all the rights and privileges which were to be theirs (see letters of protection of 1386 issued for Slemme, wife of Moses de Colmar, the Jew, and for Joseph of Richenweiler, the Jew, uncle of the above-mentioned Slemme, in "Beiträge zur Vaterländischen Geschichte," vi. 279 et seq. Basel, 1857). The franchise was in some cases revoked. For instance, in 1382 an order was issued that Umelin, the son of Menlerin the Jewess, should "never again become a citizen, nor is he to be accepted as a citizen; and he is forbidden to exchange or to buy horses." He was, however, again accorded citizenship on payment of 400 florins. Religious tolerance was assured to the Jews. In 1370 they already had a synagogue in a house which until recently was called the "Judenschule." They were compelled to remove their dead from Basel and to bury them elsewhere. In 1394, four years after King Wenzel had again given the city the right to admit Jews, the council permitted them to lay out a cemetery in a garden bought by them in the neighborhood of the Spahlenthurm, in the suburb of Spitalschüren. For every interment they had to pay to the council a tax of a half-florin for a resident and of one florin for a stranger. "True shalt thou swear, Dathan and Abiram forget not, Their fate shalt thou share Whom the earth swallowed." Even in outward appearance they were distinguished from the Christians by the so-called "Jew's hat." In 1374 a Jew was executed in Basel. Mathys, the son of Eberlin the Jew, who spoke disrespectfully of the Christian religion in 1377, was exiled from the city. Another Jew who had spoken ill of St. Catherine in 1392 was fined no less than 500 florins. A Jew who had kissed the daughter of a Christian citizen of Basel was sentenced to remain three days in the pillory and to imprisonment for life. The girl was imprisoned for five years; and the servant who had kept at a distance, so as not to disturb the lovers, was imprisoned for two years. In spite of their isolated social position, Jews were appointed by the council as town physicians. As such are named Master Josset in 1372 and Master Gutleben in 1379. The first received 25 pounds, the other 18 (or, according to others, 50) pounds, besides his fees. In 1543 the Jews were for the second time exiled from Basel; on this occasion, it is said, to please the citizens of Bern. At first they were permitted to enter the city accompanied by some official, but in 1549 this also was prohibited. In 1552 they were again allowed to enter the city once a month on payment of a body-tax of 5 batzen (= 10 cents) and 1 batz to the gatekeeper. In spite of this prohibition several Jews were employed as correctors of the press by the publishers Froben, Conrad Waldkirch, and Ludwig König, who printed a number of Hebrew works, among them the Babylonian Talmud. Abraham Braunschweig, the corrector of the large Buxtorf Bible, had special permission to live at Basel until the work was completed. Although no Jews were permitted to live in Basel until the beginning of the nineteenth century, the Jews who were expelled from Alsace at the time of the French Revolution were given temporary shelter and treated compassionately. This noble deed of the inhabitants of Basel was celebrated by Hartwig Wessely in a Hebrew poem printed in the "Meassef," 1789. 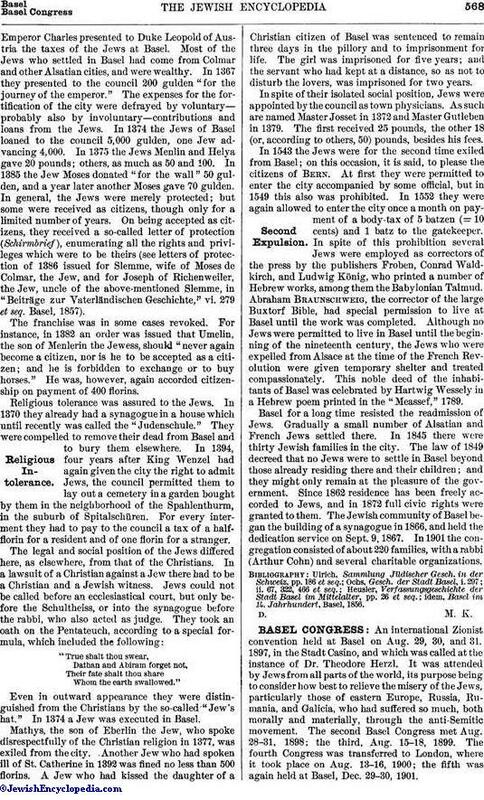 Basel for a long time resisted the readmission of Jews. Gradually a small number of Alsatian and French Jews settled there. In 1845 there were thirty Jewish families in the city. The law of 1849 decreed that no Jews were to settle in Basel beyond those already residing there and their children; and they might only remain at the pleasure of the government. Since 1862 residence has been freely accorded to Jews, and in 1872 full civic rights were granted to them. The Jewish community of Basel began the building of a synagogue in 1866, and held the dedication service on Sept. 9, 1867. In 1901 the congregation consisted of about 220 families, with a rabbi (Arthur Cohn) and several charitable organizations. idem, Basel im 14. Jahrhundert, Basel, 1856.